I am so happy to announce that the latest issue of I Like Crochet has just launched and is filled with great winter patterns! I Like Crochet is a digital magazine that includes crochet projects, various articles, in a beautiful, digital-only publication. If you haven't checked it out already you definitely should, as the latest issue features very exciting patterns, including designs incorporating fringe, poms, chunky stitches and bright yarn. This post contains affiliate links, meaning your clicks and purchases result in support for Little Things Blogged at no extra cost for you. The Foliage In The Woods Wrap is one of my favorites in this issue! Using warm tones and a 4mm (G/6) crochet hook the motifs are made first and then joined together to form this stunning wrap! This flower adorned afghan features bright and dark petals that are juxtaposed on matching two-color blocks to create a puzzle appearance. Crochet this colorful blanket to add a dose of boldness to your home. Inspired by Japanese Sashiko embroidery, white pinwheels embroidered on dark denim indigo are a fun update to a classic pairing of colors. This pillow will definitely get you hooking! The River Wash wrap is a rectangular shawl worked from the center out in both directions. 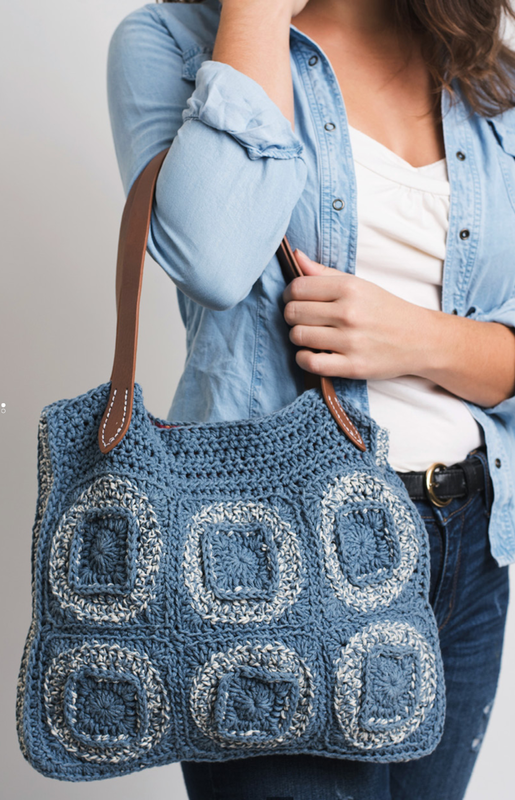 Designed in an effort to marry traditional technique and trending style, crocheters will recognize the granny stitch but will have never seen it used this way. This modern shoulder bag is super versatile and a great year-round accessory. Inspired and pieced together like patchwork jeans, this spacious bag includes leather handles and a magnetic clasp closure, making it a must-have bag for any season. This incredible scarf is a must-have for the fall and winter season and is my favorite piece in this issue! Inspired by the “cold shoulder” tees that are still so popular, this stylish shirt features kimono sleeves with a tie accent at the hem and an open stitch pattern. Plus, in January there is a very special gift for anyone who joins the all-access Gold Club! – This offer ends on 1/31/19! Join the Gold Club and receive 2 FREE crochet DVDs from crocheter Michael Sellick! If you want to give these projects a try then download the new issue today and start crocheting away!